Proprietor of M/s A K Enterprises, Aditya Mein, has donated Rs 10 lakhs to the Chief Minister’s Distress Relief Fund of Kerala for the flood victims. Expressing love and concern for the fellow brethren of the country, Proprietor of M/s A K Enterprises, Aditya Mein, Son of Deputy Chief Minister of Arunachal Pradesh has donated Rs 10 lakhs to the Chief Minister’s Distress Relief Fund of Kerala for the flood victims. In his forwarding letter to the Chief Minister of Kerala, Aditya Mein said that he was deeply pained by the unprecedented floods and natural calamities that affected the State of Kerala that caused loss of precious human lives and valuable properties. The said amount was donated to express solidarity with the people of Kerala in this hour of grief and sorrow along with the rest of the nation, he said in his letter. 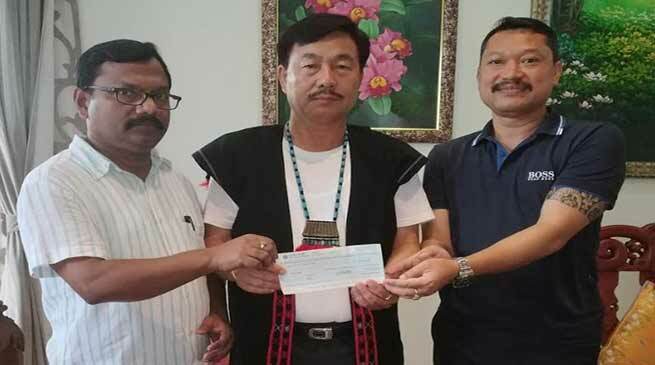 On behalf of the M/s A K Enterprise, Namsai, Manager of the firm Sibsankar Dutta handed over the Cheque worth Rs 10 lakhs to State BJP President, Tapir Gao in presence of Namsai MLA, Chau Zingnu Namchoom at Namsai today. The amount was transferred online to the Chief Minister’s Distress Relief Fund Account of Kerala today. Earlier, Deputy Chief Minister, Chowna Mein also donated his one month salary of August 2018 for the relief fund of Kerala flood victims. He joints the rest of the Nation by paying homage and condolence to the bereaved family members of the Kerala Flood Victims.